1. I want to be approachable. If I’m using social media to create the best version of myself, I will alienate myself from my friends. I want to use social media as a tool that enhances my real life interactions and friendships. I want to become friends with new people, deepen my conversations with old friends, and be approachable to people online & in real life. I can’t achieve this with social media alone. I have to go out & be with people. I need to take the time to write letters, call family members, and be an encouragement to those I live around. Social media is a small tool that can enhance relationship building, but it is not the foundation for relationship building. Friends on social media are friends in real life. I will alienate people if I’m consumed with myself and my own problems. If I have an issue with a certain person, I talk to that person alone. If I’m having a bad day, I will deal with it apart from social media. Yes, I understand that social media is a great community, but what kind of community are we willing to cultivate when we air our dirty laundry for hundreds & thousands to see!? Is it OK to walk in public with our heads hung low, our feet dragging, and our voices yelling out our everyday hard issues? NO! I’m not 2 years old! So why is it OK on social media? It’s not. 3. I will not use social media to stuff my opinions down anyone’s throat. I will share truth on social media. I will make it known that I stand with God! However, this online community is not going to know my thoughts about everything, nor will it be privy to my venting and frustration. If you want to know my opinion about doctors, shots, President Trump, movies, books, music, dancing, and all the like….then call me up! If you don’t have my number, then it’s a pretty good sign that you don’t really need my input at all. Social media adds to my life, it is not my life. Guys, I like social media. I have a blog for goodness sake! HOWEVER, if I make this social media thing too big a deal, then I start living for social media instead of actually living. I start caring more about what others think then thinking about others. If I’m thinking about myself all the time, then this will come out in everyday life interactions. It hurts my friends. It hurts my family. It hurts my relationship with God. Social media will not be used to make the world like me. 5. Social media doesn’t get the best of me. In that, I’m not going to spend more time on my social media than with my family. Down Cottonwood Lane is not going to get the best graphics, the best marketing plan, or the best of my attention…because it’s a thing. While I have a wonderful community here + a great desire to share truth, hope, and encouragement….this place is ultimately a place. I can share truth, hope, and encouragement offline just as easily! As soon as this screened world becomes more important than the breathing world, then I’ve succumbed to a 2-dimmensional life. I was not meant to live inside a screen, and neither are you! If used well, social media will be another way to encourage others, and share God’s truth & hope. In essence, it will enhance what I’m already striving for in real life not hinder my efforts. I’ve been increasingly frustrated by young women, and the way we have chosen to broadcast ourselves and our families. While I do not have a right to judge motives, or the ability to change minds & truly understand perspectives…I can know the why behind the heart of my social media. What kind of community do I hope to cultivate online? 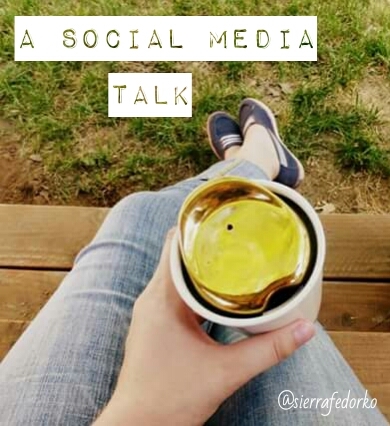 What’s the heart behind my social media? I started this post by yelling at people, but I backspaced the lecture. I want my words to be gentle, loving, and thought-provoking. I accomplish nothing when I yell, but perhaps by a gently asked question, you will have reason to pause and think. I love that you’re part of my world. May we realize that we are creating a virtual history for our children, and our children’s children. May it be a good one, full of strong examples, steady joy, and genuine love for people! Ugh. Great post! I love your 5 things, but I don’t do them very well. The only posts I have ever regretted on social media fall in one of your 5. Mostly they would have been opinion posts that push people away. Your final thoughts made me think of this verse which has been a good check point for my thinking (and I should start applying it not just to real people interactions but also social media!). James 1:20 – For the wrath of man worketh not the righteousness of God. Keep posting! This was excellent. Thank you, Audrey. 🙂 I’m no expert at this, and maybe I have to work on my heart attitude more than anything else! That’s a great (and challenging) verse!